Confession time: My kids and I love slime. Yes, I have come into messes and I have even had to scrub slime out of the carpet. But with some ground rules, we have been able to enjoy the non-Newtonian fluid over and over again without any further incident. Before we get into the best fail-proof slime recipe here are some fun facts! Like Oobleck, slime is a Non-Newtonian fluid. What this means is that slime acts differently depending on the stress put on it. When slime is left on it’s own, it will slowly ooze and drip. If you take it and pull at it quickly, it will rip like a solid. And, if you stretch it slowly, it will almost resemble hot mozzarella cheese on a pizza, able to stretch long distances before breaking. 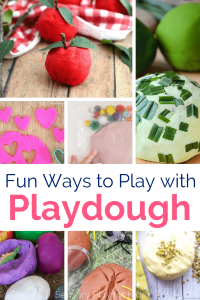 Not only is this type of play dough an awesome way to teach kids about non-Newtonian physics and engage in the benefits of sensory play, it is also a fascinating way for children to learn about chemical reactions. This is the chemical reaction that makes slime. School glue is made up of long flexible molecules called polymers. Borax dissolved in water or contact solution containing boric acid have borate ions. When mixed together the borate ions bind with the polymers in the glue to turn a liquid into more of a soild. It’s important to note that both Borax and contact solution with boric acid have the same chemical make up needed for slime. If you are concerned about whether to use one or the other, consider this movie from Steve Spangler on the safety of Borax. Ready to make some slime? Here is the best fail-proof slime recipe! Dissolve Borax in one cup of hot water, mixing the solution until you can’t see white particles. In a separate bowl, combine glue, 2-3 tbs of tap water, food colouring and glitter if you’re using glitter. Once the coloured glue is fully mixed, add Borax mixture to glue mixture. Remove slime from access water and enjoy! 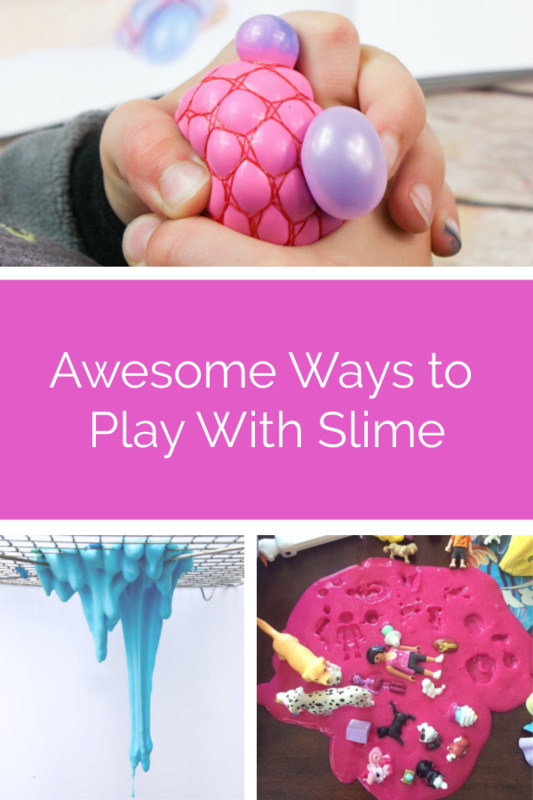 More awesome ways to play with your slime! 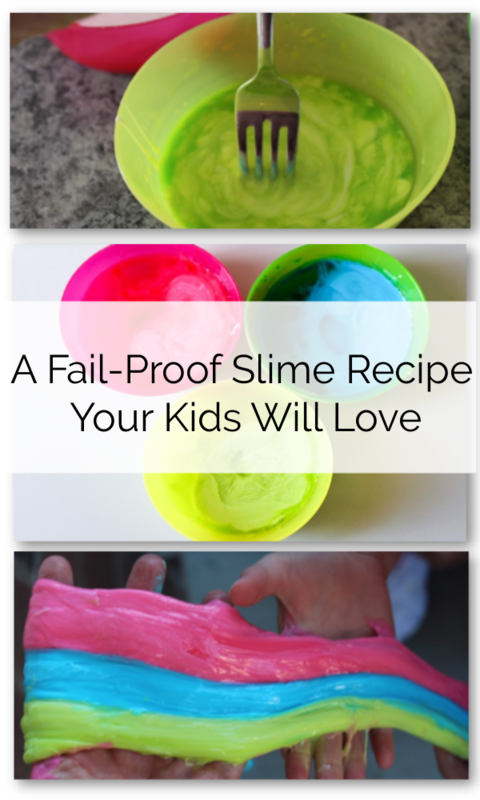 After you’ve made our fail proof slime recipe, you may want to try some of these activities. 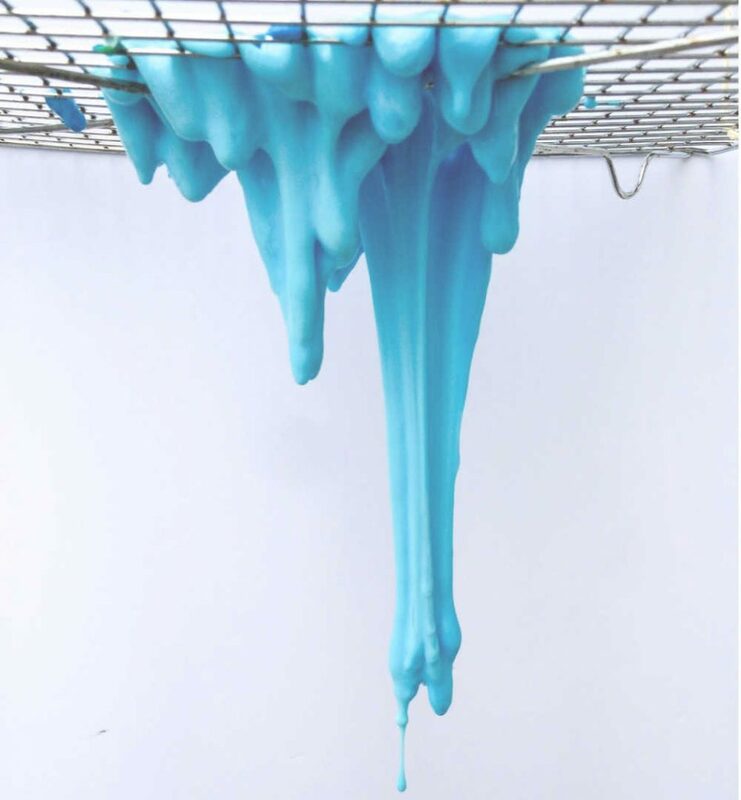 Dripping slime – hang a colander or cooling rack and set your slime on top. In about 30 minutes, you’ll have dripping slime. Learn more here. Calm down squish ball – using a funnel and a balloon put slime into a balloon as a DIY stress ball. Learn more here. Toy impressions – Grab a handful of toys and wait as they slowly sink into the slime. Remove and check out the impressions! Slime is fun but it can get on everything. Find out how to get slime out of carpet and clothes using simple steps including great ground rules too. When it comes to slime, it can be a love it or hate it thing. A couple of years ago, it became all the rage for school-aged kids along with fidget spinners and the floss dance. And with that came hilarious parent commentary about the non-Newtonian fluid running havoc in their homes. From pictures of it dripping off of countertops to slime-stained carpets, it is clear that slime can be a problem. The good news? Whether you just love it or your kids do, we have some great parent-tested ways to enjoy slime without it being a problem. Before we get into how to get slime out of carpet, let’s get into some preventative strategies for enjoying slime. As a parent, I have come into the kitchen to find dirty mixing bowls, Borax spills and and trails of food colouring. I have also spent an inordinate amount of time with a scrub brush and water getting dried play dough out of our carpet. Our rules for slime are simple. The kids have to ask before they make it. They need to clean up and put away whatever they use. The slime has to go into an airtight container. And, if they get any slime on their clothes, they need to tell me right away. Finally, they have to store their slime in an air-tight container. Since setting ground rules, we haven’t had an issue. In fact, I haven’t had to clean up anything slime-related since. The best strategy for getting slime out of carpet is not to have slime on your carpet. In order to prevent carpet spills, slime must always be stored in an airtight container. One of the coolest (and most treacherous things) about slime is that it drips. Slime left on a countertop or a coffee table for a certain amount of time will end up on the floor. If it dries, it can be a nightmare to clean up. The other crucial piece is establishing a rule where slime isn’t allowed near carpet or upholstery. As soon as slime dries, it becomes so much harder to clean slime. If slime gets in contact with clothing or carpet, remove any access immediately. Pick away anything you can get out. Using a scrub brush and water, scrub what remains. If you’re cleaning clothing, launder clothing normally. It is best to test solutions on a hidden part of carpet before trying it on the stain. Then, soak the spot with water and vinegar. Using a scrub brush clean the spot. You may want to add one of the cleaning solutions above. If any food colouring gets on your hands while cleaning, put foaming shaving cream on your hands. Wait about 30-60 seconds and then wash thoroughly. Have you had this problem? How did you get slime out of carpet? Oobleck activities are such a fun way to engage in sensory play as it has a squishy, goopy texture but also provides wonderful opportunities for learning. As a non-Newtonian fluid, it has the properties of a liquid and a solid, which has inherently encourages scientific exploration. Oobleck is quick and easy to make at home by mixing cornstarch and water (see full oobleck recipe here) and can be colored with food coloring or liquid watercolors for an added bit of fun. Below are some fun ways to play with oobleck so that kids can explore this material over and over again! Oobleck is so simple to make, but can be ‘upgraded’ to create fun thematic setups for kids. 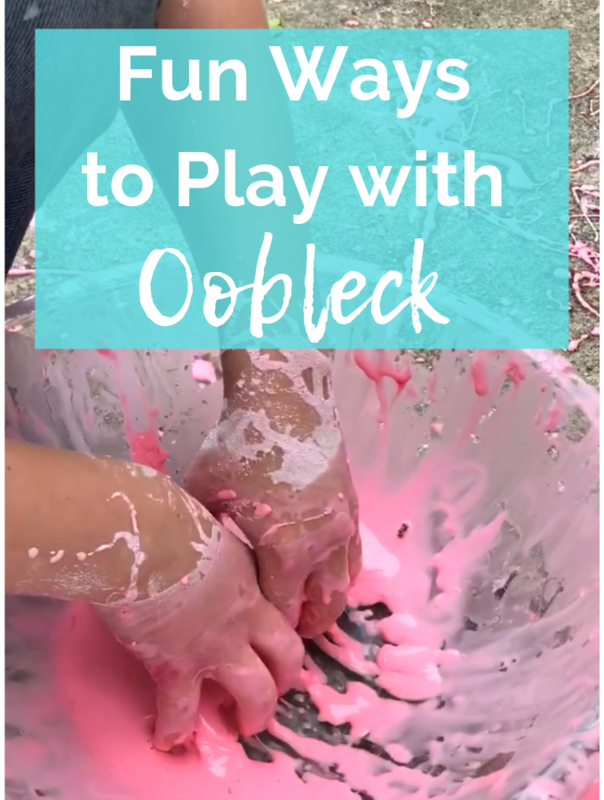 Check out the list below for fun ways to play with oobleck, including making it glow in the dark, taking it outside for paint on the sidewalk, or making it fluffy! We hope you find a fun way to play on this list of obbleck activities for kids! Don’t forget to check out the recipe for oobleck on our sensory play recipes page! 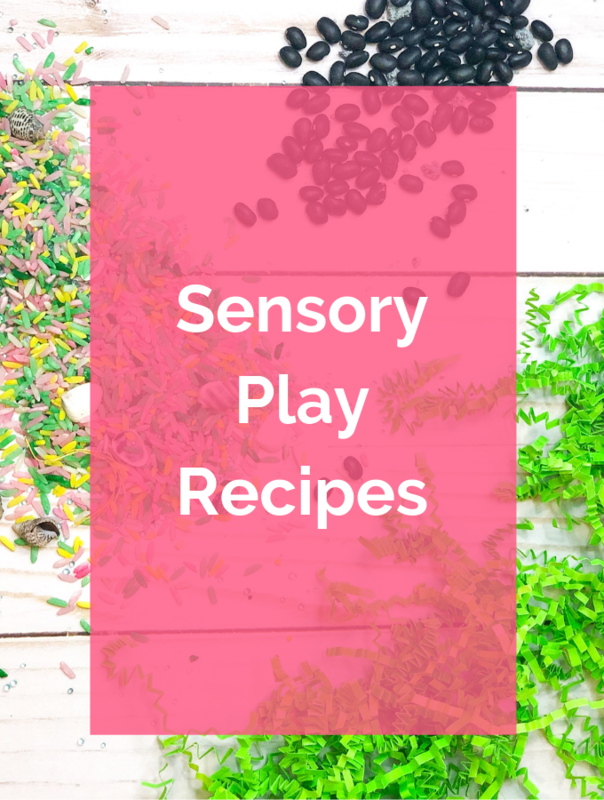 There are so many sensory play materials that can be made at home! This decreases the cost of many of these materials and can be fun to make with the kids.